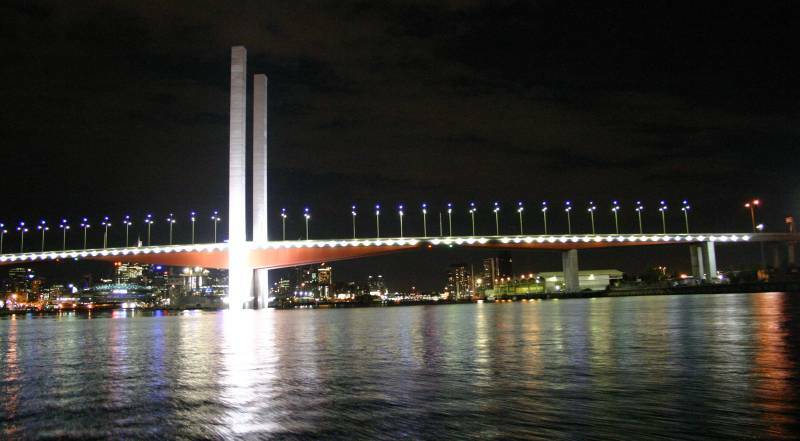 The Bolte Bridge is a large twin cantilever bridge in Melbourne, Victoria, Australia. It crosses the Yarra River and Victoria Harbour in the Docklands area to the west of the Melbourne CBD. It forms part of the CityLink system of toll roads that joins the Tullamarine Freeway from the northern suburbs with the West Gate Freeway and the Domain and Burnley tunnels to the Monash Freeway and the south eastern suburbs. The bridge was designed by architects Denton Corker Marshall. It was built for Transurban by Baulderstone Hornibrook, from 1996–1999 and cost AU$75 million. 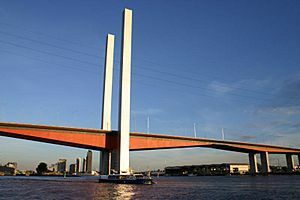 It was named by Jeff Kennett, for former Premier of Victoria, Sir Henry Bolte because it linked the West Gate, Monash and Tullamarine Freeways - projects planned or completed by the Bolte Government. It is one of the largest balanced cantilever cast in situ box girder bridges in Australia. It is built as two separate bridges of variable depth, prestressed concrete box girders, separated by a 1.15 m (4 ft) gap between the structures. The bridge has two 140 m (459 ft) high silver towers. These are on either side of the roadway at the middle of the bridge's span. These two towers are only for show, and are not joined to the main body of the bridge. The towers are hollow, and have ladders leading to a small roof top hatch. The Bolte Bridge has four spans with two main spans of 173 m (568 ft) and side spans of 72 m (236 ft). The total length of the bridge is 490 m (1,608 ft). The twin bridge has two 15.35 m (50 ft) wide decks, each with three lanes of vehicles. There is no access for cyclists or pedestrians. Other bridges in Australia built in the same way are the Gateway Bridge, Brisbane and Mooney Mooney Bridge near Gosford, north of Sydney. Bolte Bridge Facts for Kids. Kiddle Encyclopedia.